Zane Benefits, the leader in individual health insurance reimbursement for small businesses, announced today the publication of a new eBook, "How Employer Health Insurance is Ruining American Healthcare." 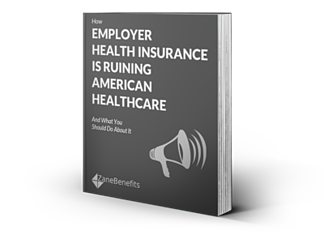 The eBook helps readers understand how employer health insurance is ruining American healthcare - and what individuals, employers, and brokers should do about it. According to Zane Benefits, health insurance in America is undergoing a dramatic transformation. Rising healthcare costs, driven mostly by employer health insurance, are punishing our nation on multiple fronts. For individuals and families, rising healthcare costs mean less money in their pockets and hard choices about balancing children’s education, food, rent, and needed care. For companies, rising healthcare costs make it more expensive to add new employees and reduces budgets available for marketing, customer service, and product development. For the government, rising healthcare costs lead to reduced funding on other priorities such as infrastructure, education, and security. This paper walks through how we got here, where we are going, and what you can do about it.